Metalkit is another of my random side-projects. It’s a very simple library for writing programs that run on IA32 (x86) machines on the bare metal. It isn’t an operating system, but it does contain some of the low-level pieces you might use to create one. I created it partly for fun and for the challenge, and partly to use as a framework for low-level hardware testing at work. It is open source, released under an MIT-style license. 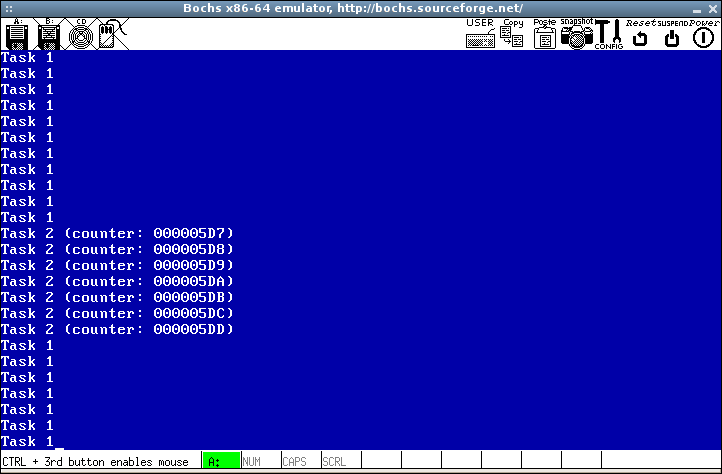 A 512-byte bootloader that works either as a floppy disk MBR or a GNU Multiboot image. When you build a program with Metalkit, the same binary image can be used either as a raw floppy disk image or as a “kernel” image in GRUB. This makes it easy to use your programs on virtual machines (VMware, QEMU), emulators (Bochs), or real machines. Basic PCI bus support. You can scan for PCI devices, find out what resources (I/O ports, memory, IRQs) they have, and poke at their configuration registers. A very tiny zlib-compatible decompressor, the “puff” reference implementation of DEFLATE. Low-level support for the PIT timer. A small, efficient, and powerful interrupt subsystem. ISR trampolines are assembled at runtime, saving space in the binary. Any ISR can execute the equivalent of a longjmp(3) on return, making simple thread context-switching very easy. Includes basic PIC interrupt routing. Includes default fault handlers which dump CPU registers and the stack any time an unhandled fault occurs. 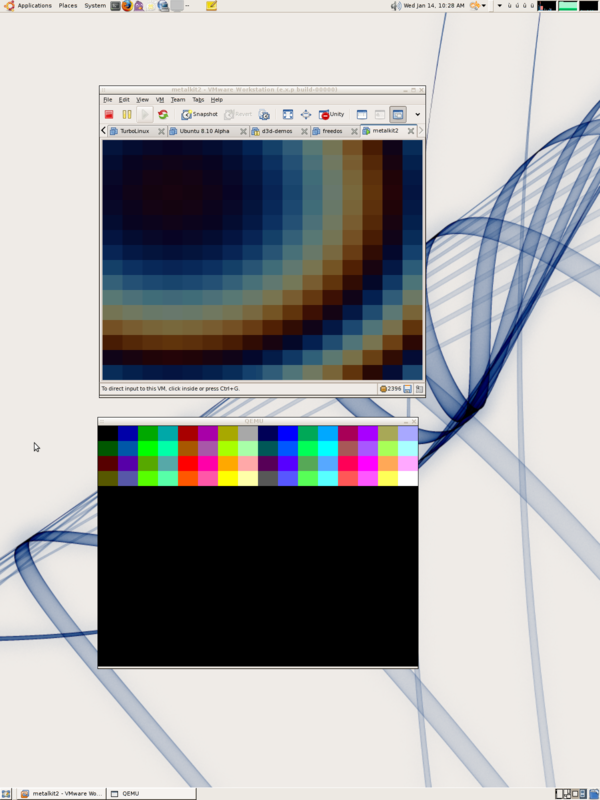 This example compiles to a 2962-byte image, and uses only about 1500 lines of library code. This is great for educational purposes, because it is practical to understand the purpose of every byte in that compiled image– and when this example is running, that’s the only code running on your computer. If you want to play with Metalkit, all you need is an x86-compatible PC and a copy of the GNU toolchain (GCC and Binutils). You also probably want Subversion so you can check out the Metalkit source from http://svn.navi.cx/misc/trunk/metalkit/. Also, if you’re interested in OS development or just hacking on the bare metal, the OSDev.org Wiki is an invaluable resource. This entry was posted in Metalkit and tagged assembly, extensible project, low level, software, x86 on March 13, 2008 by Micah.